The epic tale of Gilgamesh is one of the great creations of world literature. In his struggle against the fate of all mortals the hero seeks out at long last the survivor of the Great Flood, in order to learn from him the secret of immortality. The quest proves unsuccessful, but the end finds Gilgamesh at peace with himself and his surroundings. The impact of the epic may be gauged by the fact that as early as the second millennium BC it was known in at least four languages. Its influence on art and thought spread to many lands and cultures. Because of its close Biblical associations, the episode chosen for illustration has been taken from the epic's account of the Flood. 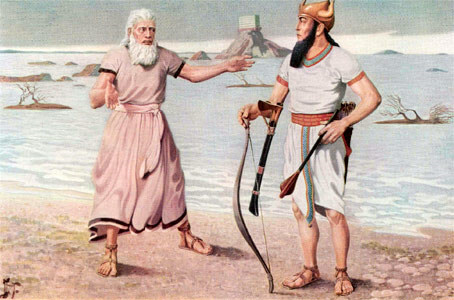 After a long and fateful journey, Gilgamesh is at last in the presence of Utnapishtim, Mesopotamia's counterpart of Noah. Utnapishtim has just reached that point in his tale which finds the Ark come to rest on Mount Nisir, while the slowly receding floodwaters present a picture of bleakest desolation. To be sure, the distance between Mount Nisir - an 8,489 foot peak near modern Sulaimaniya, 175 miles north-east of Baghdad - and the place of Utnapishtim's permanent retreat "in the faraway" was imagined to be far too great for compression into a single picture. But so vivid is the tale which is being unfolded to Gilgamesh that the reader should have no more difficulty than did Gilgamesh himself in seeing distant outlines of the Ark with his mind's eye. The Ark is described as a perfect cube consisting of seven stories, each divided into nine compartments. Since the description in the epic is quite specific, our modern notions as to what is seaworthy had to be discarded. Nothing is said, however, about the appearance of Utnapishtim, and the artist re-created him according to his own inspiration.